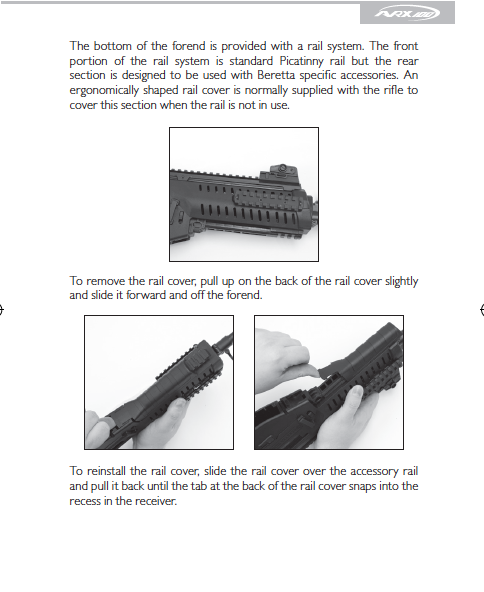 Lower Picatinny rail (5” of Picatinny attachment) for Beretta ARX100. Black finish. Assemby Instruction, click here. Great product. The only thing bad about it is that it does not come with instructions. Went to Lowes to see if there was any tools to move the pin for installation. Turns out that you have to move a cotter spring to get the slide out for you to install the rail. Would have been nice to have the instructions to avoid having to travel to the hardware store. Now, I'm just waiting for the new plant to open up for the different caliber barrels to be manufactured.